Sponge cake is a non-yeast cake that uses whipped egg whites to add air to the cake and lift it rather than having the dough rise from yeast. It sounds complicated, but my grandma's recipe is pretty easy and it tastes way better than a box cake. You do need an angel food pan and a bottle to tip it over on because when it comes out of the oven, you tip it over and let it cool upside down so it doesn't fall in. Don't let this scare you off; just follow my directions and you'll be fine. Separate the egg yolks from the whites. Set the whites on the side and beat the yolks in a mixing bowl with a mixer until they are thick and lemon colored. Add sugar to the egg yolks gradually mixing it in. Next, alternately add in the flour mixture, water and vanilla until completely used up and mixed in. In a large mixing bowl, beat the egg whites and cream of tartar with a mixer until they are stiff. This can take a couple of minutes, but when you lift your mixer out of the bowl the egg whites should rise up to a point where you removed the mixer and hold there. If you remove the mixer and the egg whites are too liquidy, go back to mixing. When the egg whites are stiff, fold in the egg yolk/flour mixture. Folding typically means, adding a small amount and gently mixing it in with a soft stir, adding a little more, gently mixing until the two are combined. you will notice a little yellow/white color difference because the two mixtures aren't completely blended. This is okay and the way it should be. Once the sponge cake is completely cool, slide a butter knife around the outside edges so it slides out easily. Tip it upside down and slide it out. Frost it with your favorite frosting or use one of the frosting recipes here! 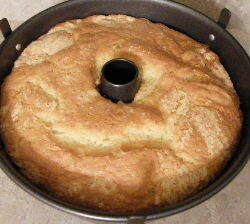 Click here for more cake & frosting recipes like Sponge Cake!